Joe’s Pizza Is Terrific. Why Is This So Hard? What the hell has happened to New York? 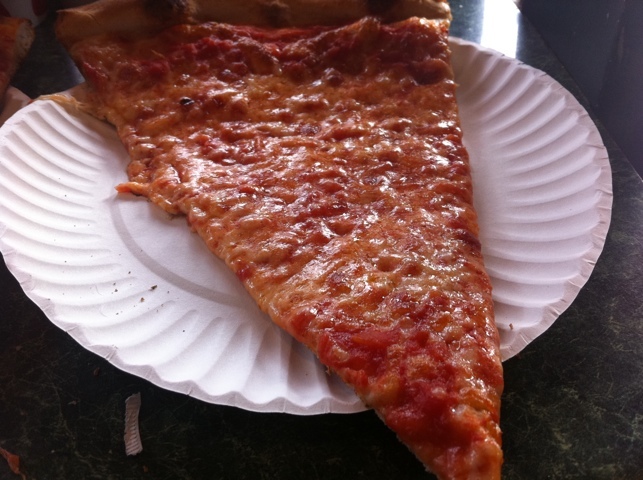 Perhaps I am inspired by contributor Hugh’s missive on hot dogs, pizza and the character of NYC, but for the life of me I can not fathom how come getting a good slice of pizza is so damn hard in this town. Good pizza used to be ubiquitous. Now, you have to travel to get it (provided you know where to go). The new location is quite close to the old one. 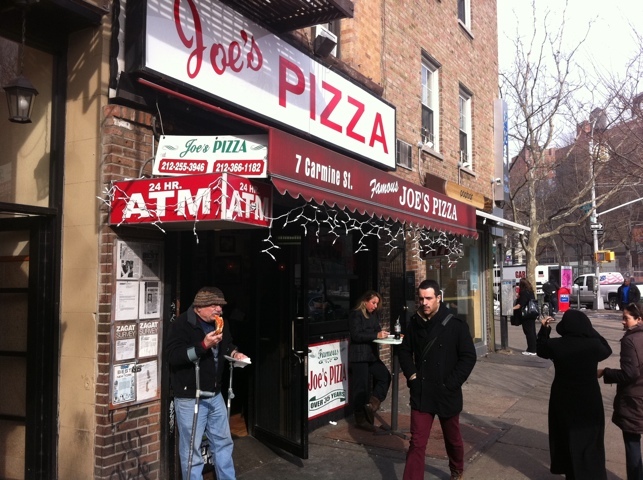 Joe’s on Bleeker (it has since moved away from the corner it was housed in, as seen in the opening scene of Spider-Man 2) has been a stalwart, and despite my sworn loyalty to Sal & Carmine’s, it easily has one of the best slices available, period. I mean it is delicious. The confines are still as cramped as ever. One thing that still works (or doesn’t) about Joe’s is that it is still the same tiny, inconvenient storefront. I am sure their popularity would probably allow them to open a bigger sit-down joint but the old-school, cheap-looking (though doubtless very expensive) digs add to the charm and authenticity of the place. Even though they opened in a new location, they made no effort to make it feel new. It’s the same old crappy stools, same old too-small, overcrowded round tables, complete with shoddy dispensers for oregano, hot pepper and whatnot that are generally missing their labels and caps. It already looks better than most slices. But just look at that pie. Nice, thin, bubbling crust, with faint char. Notice the sufficiently red color, suggesting that someone actually put SAUCE on the slice. Hallelujah. Do you see how parts of the cheese have browned nicely? I mean why the heck is this so hard to find? Watch out for fault lines in the crust. Do you see what’s going on there? 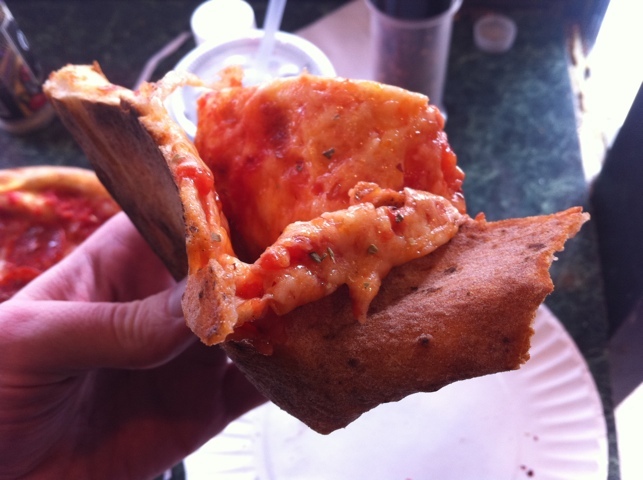 The slice has folded in on itself because when I pinched it to pick it up, fault lines cracked in the crust, giving me that wonderful, brief struggle I used to love about eating a slice of pizza. It was part of the fun. There’s this great moment in the opening theme music to the ’80’s TV show Mike Hammer in which Stacey Keach can be seen losing his fight with a slice of pizza (see it below at about :44 seconds in). That is correct. Why is that so hard?? 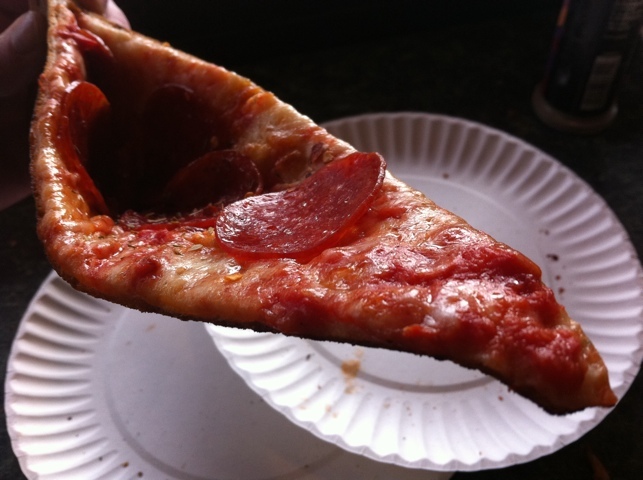 Note the width of the pepperoni compared to the crust. That's thin! Foolishly I also opted to get a pepperoni slice. It was a mistake. The pepperoni itself produced (not surprisingly) a hefty ladling of grease which pooled in the pocket where I was pinching and ultimately decided to journey across my hand. I should also point out that the pepperoni flavor was ok, but really just interfered with the enjoyment of the slice itself. On balance, I don’t think I’ll do it again: it’s greasy and regrettable. Stick with the plain slice. Joe’s gets it right. It’s delicious. 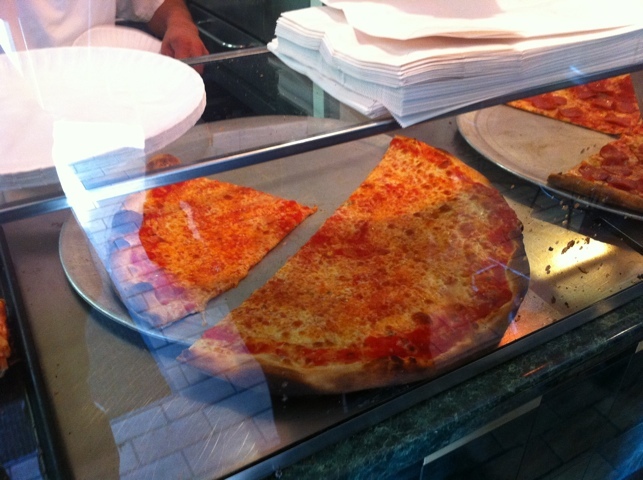 If I could use Joe’s and Sal & Carmine’s as spurs in the sides of New York’s pizza industry, I would. Get it together. There should be more like this, not less. Sheesh.